Sash windows can be centuries old but with modern repair and upgrading techniques these classics can continue to perform perfectly well. A Queen Anne building, left, with exposed box-frames around the windows, and a Georgian house, centre, showing the impact of moving the frames back behind the brickwork on the character of buildings. By the time this Victorian terraced house (right) was built it had become possible to use much larger panes, and again the character of the architecture changed dramatically as a result. The classic box sash window has been a feature of Britain's architecture for over three centuries. Thought to be of French origin, this timeless style was adopted in Britain as early as the 17th century, and is truly part of our heritage. Countless properties, diverse in style and stature, share this common trait. From traditional towns and cities, to rural villages and conservation areas, the sash window can be found practically everywhere: in stately homes, Georgian period properties, Victorian and Edwardian terraces, charming cottages and listed buildings of all types. The development in style of the sash tracks historical events, architectural evolution, even quirkiness. While the majority of sash windows consist of box frames, where the weights are hung vertically to counterbalance the sashes, local variants of sideways sliding sashes (or 'Yorkshire' sashes) are present in many English counties. A significant style change was invoked as a result of the Great Fire of London and the building acts which followed in 1709 and 1774. The first stipulated that frames in the capital should be set back a minimum of four inches from the facade so that fire could not travel so easily from one window to the next. The second required that the boxes be set back behind the masonry. The result was that the sash boxes on either side of the sashes disappeared from exterior elevations, and the window openings became narrower and more elegant. An additional influence during this period was the introduction of a window tax, which meant that certain non-essential windows were bricked up to avoid tax liability. 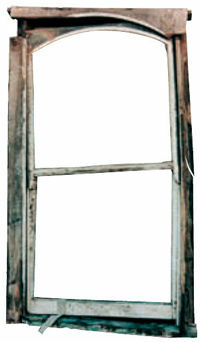 At this time, an arrangement of six panes in each sash was fairly common, because glass was expensive to manufacture and only available in small sizes. Glazing bars, which had been thick and heavy in the late 17th century, were now thinner and more refined and by the late 18th century larger panes were being manufactured from cylinder glass, enabling much larger panes than the old crown glass method of production. By the mid 19th century many older multi-paned windows were substituted with four-paned windows and, by the turn of the 20th century, houses were being built with large sash windows, with each sash consisting of one large pane. Described by one expert as 'the eyes of the facade' to highlight their importance to its character, original windows have obvious aesthetic attributes. Handcrafted in original timber, they are stylistically in keeping within the context of a traditional property. Coupled with their architectural significance, not to mention natural longevity, it could be argued that they have earned their enduring status. However, the threat to the sash window is ever-present. Flaking paint and decay can appear unattractive relative to pristine PVCu, or modern timber counterparts. Most who have had first hand experience of the sash, even ostensibly in relatively good working order, will be familiar with their common deficiencies. Draughts and rattles, not to mention noise penetration and sticking problems, are regular afflictions. At the other end of the scale, rotting frames and meeting rails, damaged glazing bars, faulty weights, or broken glass are all too common. These factors, taken individually, not to mention collectively, can suggest that replacement is the obvious and, some would contest, only logical solution. To frustrated homeowners and inhabitants of commercial properties - particularly those used as a working environment - there often appears little choice but to resort to 'plastic surgery' for original windows and doors, or their replacement with modern imitations in either plastic or timber. Perceptions persist that the 'PVCu pretender' can provide longer life and have lower maintenance requirements. Before deciding to replace original windows, however, it is worthwhile remembering a few salient factors. Taking aside sentimentality, the traditional sash has several practical advantages. Firstly, original sash windows have been made by a skilled craftsman, individually, using the highest standard of timber and materials. A testimony to the longevity of the design is that it has already withstood centuries of wear. In contrast, many modern materials used in windows have begun to yellow and crack after 10 to 15 years of usage. Even new timber windows, made to original concepts, do not necessarily have the endurance of their older counterparts. This is because in the Georgian and Victorian periods the softwood timber in general supply was second to none. It came from the Baltic where it had grown slowly in the cold environment, producing a very dense, tight-grained wood. Timber of such quality is difficult to find today. Despite perceptions to the contrary, a window produced in the 18th or 19th century can often be salvaged virtually intact and renovated to provide excellent standards of performance. Experience of dealing with sash window renovation over many years indicates that as much as 95 per cent of the timber in an original window can be retained. Rotten timber can be routed and repairs made using a synthetic wood repair system. This means that even windows considered beyond repair may have only superficial deterioration and, once overhauled, can continue to provide, quite literally, centuries of further loyal service. Whilst the individual condition of windows can vary dramatically, even within the same property, an expert survey will itemise the scope and extent of renovation required on a bespoke basis. Window renovation and overhaul should not be considered to be a cheap 'quick-fix' solution; it is a craftsman-driven method of restoring an original window to good working order for many years to come. Despite its appearance, the wood in this window is generally sound, and it can easily be repaired to provide many decades of further service. A comprehensive window overhaul will commence with bonded repairs of rotten wood using a two-part epoxy resin, or, in the case of extreme decay, replacement of complete sections of the frame. Delicate glazing bars can be replicated to match the originals. Similarly, while modern production techniques have ensured that glass is now flawless, it is possible to source glass with manufactured imperfections to emulate the original glazing where panes have cracked or broken. Original crown, muff, or cylinder glass has tints and bubbles which would cause natural refractions of the light, and is often considered to add charm and character. Sash weights, housed within the frame and used to counterbalance the sashes, can often be misaligned, imbalanced, or completely missing, causing the sashes to stick when opening and closing. As part of a comprehensive window renovation, these should be rebalanced. Sash cords are also subject to decay, but these, together with pulleys, can be replaced to ensure that they slide smoothly. In addition to standard repair and refurbishment, it is possible to upgrade a sash window to levels of performance comparable with modern replacements. A little-recognised benefit of an original sash window is that it remains one of the most efficient designs for controlling ventilation. A well-maintained and designed sash window usually has a 3mm gap around its moving faces to allow the window to be opened and closed easily. However, over the years, routine wear and tear, combined with painting and decoration will result in the operational tolerances changing substantially - hence the draughts and rattles. The significance of poor sealing around a frame can create an equivalent draught effect to that of having a 125mm hole in the centre of a window. Conversely, improvements in comfort levels and energy savings usually associated with double-glazed replacement windows are largely attributable to the weatherseals, with very little comfort and energy savings being linked to the 'u - value' (or energy saving effect) of the glazing itself. However, windows do not have to be replaced to gain these energy saving benefits, since existing windows and doors can be upgraded without any significant loss of character or material. by reducing the air gaps surrounding the sashes, dramatic improvements in noise attenuation can be achieved, with the potential to reduce the effects of external noise by up to 10dB. Left: Re-cording a sash window using the traditional figure of eight cording method (Photo: Mark Davey, Ventrolla). Middle and right: Most of the heat loss from an original sash window is due to the gaps, not the glass, and the windows rattle in the wind. Draught stripping resolves the problem without losing the original glass or the frame. A further perceived drawback of the original sash system is the perennial problem of cleaning and decoration. Being at best cumbersome to manoeuvre, and at worst jammed solid, sash windows can quickly lose appeal. This problem can be overcome on a lasting basis through the introduction of a system of fittings which enables both sashes to be easily removed internally. This will allow cleaning and maintenance to be carried out from within a building and in the case of larger properties, without the need for scaffolding. With homeowners increasingly seeking to preserve the traditional appearance of their properties, it is to be hoped that knowledge of alternative solutions to window related problems will continue to grow. Conservation officers, specialist architects and surveyors and other conservation professionals are playing a vital role in providing guidance and advice to the owners of listed buildings on the options available to them, but still far too many fine and historic windows are being replaced unnecessarily. Before making a decision to discard sash windows, even if they appear beyond redemption, it is always worthwhile consulting experts. They can help to determine the extent of deterioration and guide the process of renovation or, where really necessary, replacement. This article was prepared by JEANETTE BOWDEN and ABIGAIL CRAGG of Ventrolla Limited.